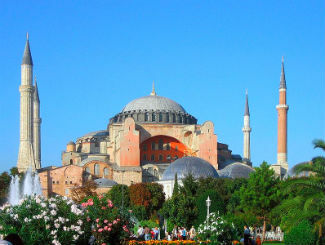 Let’s visit Hagia Sophia, considered to be one of the most beautiful buildings in the world. It has served as an important site for two separate religions for hundreds of years each. It is located in Istanbul, Turkey. Hagia Sophia was built as a church during the Byzantine empire. Istanbul was known as Constantinople at the time. It took six years to build and was finished in 537 AD. Its most unique feature was a huge dome that appeared to float over the base. Hagia Sophia’s size was so impressive that it remained the world’s largest church for almost a thousand years! In the 1400s, the Ottoman Turks had the church converted into a mosque. Many of the original mosaics were plastered over, and the four minarets were added. In 1935, it was converted into a museum in homage to two religions (Christianity and Islam) and two empires (Byzantine and Ottoman).